Secondary Window - The moving sound wave inside of the mouthpiece is now able to strike the vibrating reed above the bore of the mouthpiece instead of the mouthpiece material that is usually there. The effect is similar to a moving ball striking a moving bat. Home Run! New Facing Technology and Curve - We have invested in new CNC technology and have come up with a proprietary way of putting on a new facing curve, which is perfect every time. Almost all metal mouthpieces in the past and at the present time are made out of brass which can contain up to 3% lead. The lead in the brass is one of the components that give this particular brass it ’s hardness or rather it’s softness which makes it have a particularly pleasing sound to musicians. Proposition 65 from the state of California requires manufactures to label any products that have compounds in them that have been found to cause Cancer or Reproductive Harm. Lead is one of these Compounds. JodyJazz mouthpieces are electroplated with a layer of copper, then a layer of Nickel, Silver or Rhodium, and then a layer of Gold or Silver. This electroplating ensures that the raw brass is never in contact with the player. I hope this email finds its way to Jody. He will with all likelihood have zero remembrance of me; zero. At the age of 53, I began taking music lesson here in CT and learning to read music. At approx. 22 months, I purchased my Yamaha, Custom EX and began researching mouthpieces. At some point I emailed Jodyjazz with questions and to my surprise, I received a phone call from Jody. In part, because of that call, I became a customer and purchased the DV for tenor. Rather recently, I purchased the DV Chi. You should know, that the customer service when I purchased my DV Chi was also outstanding. Other than the mouthpiece that came with the horn, Jodyjazz is the only mouthpiece I have ever owned. I thought you'd like to know, that this summer, with 4 years of training I entered a new jazz competition and subsequently became the first winner, of the Hartford Jazz Society's Emerging Jazz Artist competition (2017). I will begin my 5th year of training in February 2018 and as you know, I have a lot to learn, but I will be doing it with my JodyJazz mouthpiece. ; Thank you for helping me to begin my journey toward fulfilling a dream. A loyal customer, Gregory B. Sneed (GB)"
"The DV CHI is my number 3 tenor mouthpiece purchased from Jody jazz and I couldn`t be happier, have played the DV, DVNY and now the DV CHI and I can`t beileve the tone and projection of this piece, Jody you are my best friend for life Thank you so much!! " " Jody and staff, I have been playing the DV CHI 7* for about an hour now, and you can forget the two week trial period, you are never getting this piece back!!! It's like I have a new horn and a new sound, playing with ease! I play an early 60's Strasser Marigoux that I have been battling for years, with a Dukoff D7, I thought it was me, that I just did not play enough, or the horn. The guys at the repair shop swore to me it was a sweet horn, no Mark VI or Balanced Action, but a pretty sweet horn indeed. Until now I had many doubts. The sound I am getting from the DV CHI is instantly better, all of the notes come out with ease, I used to worry when playing live that certain notes would not come out, lower register and sometimes the middle D was extremely weak. When playing jazz tunes such as "Turnaround", dropping an octave from middle D to A, it was never certain how well it would come out. The DV CHI has changed that completely, it drops clear and precise every time. Just want to thank you for creating such an amazing piece, without it, I had no motivation to play, the sound was not what I thought it should be and hitting certain notes was always a struggle. This old horn sounds amazing with your DV CHI on it and the notes seem to now come out almost to easy. I have even moved from Rico 2.5, to Rico Jazz 3M that you sent with piece, instantly, my old mouthpiece pretty much refused to move up to a stronger reed. This is incredible, my motivation to play now is through the roof, and, I am finding that I am really not that bad of a player after all!!! Thank you again, Chas "
"I got the DV CHI 7* in yesterday. I can't begin to tell you how pleased I was from the first note. I don't think I've ever played a mouthpiece that was that wonderful- you could tell that there was an incredible amount of attention to detail in the piece. There isn't a flaw in it! The first thought that came to my head was, "This is the first time I've felt so comfortable from the first note, that I could possibly take it to a gig and be totally fine, from the bottom to the top of my horn." So, I did. Took the piece out on a gig last night here in Charlotte, NC and with no issue whatsoever, I played the gig probably better than I ever have before (I've played this gig every Tuesday that I've been home since I was 14 years old). What can I say? Nothing less than incredible." I wanted to once again express my appreciation for the new JJ DV CHI 7*. I've been playing a DV 7* Tenor and a DV 7 alto piece for years, and simply put, they are the best mouthpieces I've played in my over 30 years. I absolutely love these pieces. Seriously, I've owned them all and I've never played anything like the DV series. What I particularly appreciate is the effortless response and huge rich sound that comes out of these pieces. I'm always receiving wonderful comments about my sound. With the DV CHI, you nailed it again. The first time I tried this piece, I stood speechless. The sound of the DV CHI simply put is "amazing." Effortless and soooo comfortable as usual, with a big, rich, deep sound (not too bright; not too dark) with incredible projection and a wonderful resonance and yet a nice smoothness to the sound. No shrillness whatsoever. Seriously this piece will cover all genre's from mainstream jazz to blues to R&B, etc. The workmanship is second to none, tips and rails are absolute perfection and I'm giddy for having had the opportunity to get one so early. I've owned so many pieces over the years and this has got to be the best I've ever played. I�m not sure it can get any better. Thank you so much again for your kindness and time. I'm having a blast with the DV CHI. I truly believe you are the premier maker of exquisitely crafted saxophone mouthpieces and I'm so pleased to be turning several players on to your pieces. "I feel that the Jody Jazz New CHI Tenor Sax Mouthpiece is one of the best tenor sax mouthpieces now on the market ! Fat and rich in harmonics sound from top to the bottom, absolutely immediate response, friendly with new reeds, very flexible - you can play soft, reaching big fat sub tones as well pushing a lot of air - you can squeeze many colors from your instrument , also I feel that it's very wise to use silver plating because it will bring you more color and timbre, more presence and warmer sound qualities. And to all off that we can add the extraordinary absolutely "Zen" simplicity design at the same time very effective in all sense ligature called " The Ring " also silver plated , I just loved The Ring - My precious 🙂 ! , finally we have a free vibrating and breathing almost speaking reeds. Jody Jazz CHI mouthpiece is pure absolute art and intelligence wisely combined by it's creator Jody Espina with the pure heart and soul." 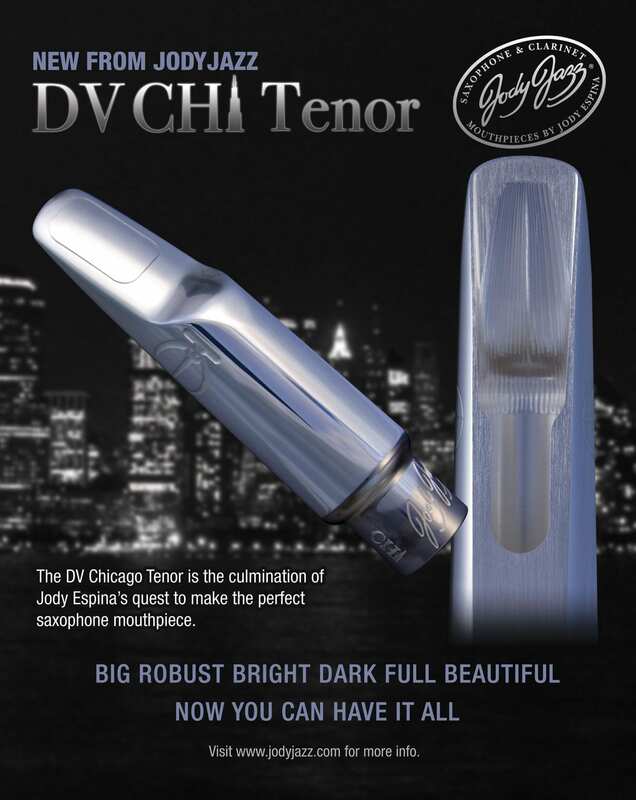 "The DV Chicago is the most all around tenor mouthpiece I have played until now. I have played a lot of mouthpieces from different manufactures, only to find one mouthpiece to work well for one horn such as the alto and not the tenor etc... I feel that Jody is a one stop shop for reed players." Thanks for the producing the DV Chicago Tenor model- it plays great! I find that there are more overtones, harmonics and better projection in it than ANY of the vintage pieces of all brands that I've been playing. I also feel there's an incredible flexibility and "elasticity" to it which allows me to shape and achieve the sound and color at all dynamic ranges that I'm used to getting with much greater ease- very multi-faceted. I find that just about any reed works right away on it, and the articulation and altissimo is superb. It blends well in the big band stuff I do (traditional or Zappa! ), and has a "fat" Dexter quality and "buzz" to it for acoustic jazz. But maybe most of all for the working musician, you no longer have to reach for that "high baffle" piece for the "loud" part of the club date, as the flexibilty in this Chicago piece can be pushed for as much brightness as needed, while still maintaining the perfect blend of treble and mid range that really give a tenor sound that depth and "bottom end". Thanks again; will there be an alto one in the future? " The DV Chicago is the most all around tenor mouthpiece I have played until now. I have played a lot of mouthpieces from different manufactures, only to find one mouthpiece to work well for one horn such as the alto and not the tenor etc... I feel that Jody is a one stop shop for reed players. I feel that the Jody Jazz New CHI Tenor Sax Mouthpiece is one of the best tenor sax mouthpieces now on the market ! Fat and rich in harmonics sound from top to the bottom, absolutely immediate response, friendly with new reeds, very flexible - you can play soft, reaching big fat sub tones as well pushing a lot of air - you can squeeze many colors from your instrument , also I feel that it's very wise to use silver plating because it will bring you more color and timbre, more presence and warmer sound qualities. And to all off that we can add the extraordinary absolutely "Zen" simplicity design at the same time very effective in all sense ligature called " The Ring " also silver plated , I just loved The Ring - My precious 🙂 ! , finally we have a free vibrating and breathing almost speaking reeds. Jody Jazz CHI mouthpiece is pure absolute art and intelligence wisely combined by it's creator Jody Espina with the pure heart and soul.